Time: A few extra minutes on your next trip to the store. If you don’t drink coffee, well, don’t worry about this one. But as coffee is said to be the second most valuable traded commodity in the world (second only to petroleum) and roughly a gazillion people drink it, I’m going to assume that some of you out there might be interested. Coffee is one of the most hotly debated things around, it seems. There are tribes for Keurig and tribes who roast their own in popcorn poppers; there are the pro-Starbucks and anti-Starbucks camps; there are those who only drink Dunkin Donuts and those who won’t touch coffee if it isn’t Fair Trade, Bird-Friendly, Shade-Grown, Organic, and union-picked. Like everything else I write about, what you choose is all up to your own personal values and the life you find yourself in. Wherever you fall, today’s One Simple Thing is going to suggest taking one small step up the coffee ladder. Most large coffee companies (usually the ones you find in big metal cans at the grocery store) source their beans in third-world nations without much thought to the environmental and social damage caused by their product. The so-called “Green Revolution” in the 70’s and 80’s shifted coffee from a product grown in the understory of living, vibrant forests to one grown as a sunny monoculture, bulldozing forests and saturating the earth with chemical pesticides and fertilizers. It’s truly one of the most poisonous industries on the planet. People fare even worse. In addition to being exposed to all those poisons, coffee plantation workers can lead really dreadful lives. In some parts of Guatemala, for example, on large plantations it’s necessary for a coffee picker to meet a quota of 100 pounds of coffee cherries in order to receive their minimum pay for the day: less than $3.00. 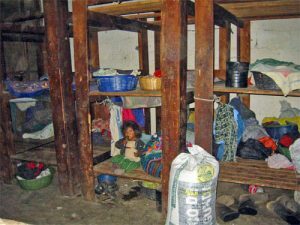 With their earnings, they can go back to their fetid workers’ quarters, often a temporary shelter where they have left small children to fend for themselves all day, and where they may use the same water to cook, bathe, and wash up. I love coffee, but that sort of thing really takes the joy out it for me. I’m 53, and I’m done causing other people pain so I can enjoy luxuries like coffee. So. Today’s action is this: Find yourself a coffee that aligns better with your values, and try it for a week. This can be whatever is important to you: social justice, rainforest protection, anti-Monsanto, you pick. Most grocery stores will offer some sort of alternative of this kind. If yours doesn’t, try a natural-ish grocery store like a Whole Foods Market, Alfalfa’s, Natural Grocers, Hannaford, Trader Joe’s, and the like, or go to a local coffee shop (chain or not). As a last resort, look online. 1) Check out the coffee selection and read the labels. Try to look for actual facts and figures, rather than vague claims like “sustainably grown.” For example, Equal Exchange coffee is clear that “over 98% of (our) coffees are certified organic by volume.” Allegro Coffee (the local coffee we drink) is owned by Whole Foods Market and publishes their “Social Scorecard” to show where their coffee comes from and how they give back. If you’re into Fair Trade, the list scrolling on the right of this page should give you some ideas: http://fairtradeusa.org/products-partners/coffee. 2) If you’re not finding anything, ask. There was a time in my life when I would have felt funny doing this. I don’t any more — I guess I’ve finally reached the crossover point where wanting to feel good about what I buy has eclipsed any inconvenience I might be causing someone by asking to describe what they’re selling me. Sue me. 3) Buy something that resonates with you, and give it a try. Because our coffee costs a little more, we end up drinking less of it, but savoring it more. This is a recurring pattern for our greenly hedonist lives: We’d rather have less of something that’s truly awesome rather than endless buckets of something mediocre. Especially if the latter is causing misery and destruction halfway around the world. It’s one thing. It’s easy. Go forth and green yourself. « Friday Freedonist: What’s Free in YOUR Town?